ColumbaFest 2018 … it’s coming! Book now. 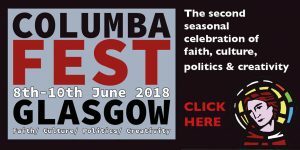 weeWONDERBOX’s flagship urban festival: ColumbaFest returns to Glasgow city centre on June 8-10th, 2018. Our theme: ’Dreams & Visions’ … on what makes ‘prophecy’ today. Expect live music and spoken word, workshops, walks, talks and worship led by a fantastically diverse group of contributors including Pádraig Ó Tuama, Ian Bradley, John L. Bell, Alyson Hallet, Lorraine McIntosh, Andy Thornton, David Heavenor, The Hazels, Carol Marples, Craig Gardiner. Much more to be confirmed soon. Come for a day, an evening, or for the entire weekend. Keep an eye on this blog, the Wild Goose Resource Group website, and the weeWONDERBOX Facebook and Twitter for more info as it is released. And you can sign up to our eNews too, here. We’re offering an Easter Early Bird offer on ColumbaFest weekend tickets of near 20% off the full price (until midnight on Wednesday 4th April). It’s a super short Easter offer, so don’t hesitate.